Lauren Rudick is an international yoga instructor based out of Montreal, Canada. She gives workshops and retreats abroad with her latest coming up in Costa Rica and Morocco. Her classes are infused with humor and positivity, helping students build confidence on and off the mat. Lauren originated the 365-day handstand challenge to help bring some play into practice and unite inversion-addicted yogis around the world. Honoring her creative side and inspired by yoga, Lauren keeps her hands busy creating Avigna Yoga Jewelry. Lauren’s joys in life include bare feet, snowboarding, delicious food, beaches, climbing trees, spontaneous world travel and spooning her dog Julius. Yoga is…my lifestyle, my livelihood, my love, my questions, my answers, my biggest challenge, my biggest comfort. The people. Meeting and interacting with new faces in new places. Learning every day. My physique is much more trim than it used to be, and obviously more muscular. My personality- well yoga has given me tools to deal with the challenges of life better. I feel like I can keep my cool, I'm less anxious, I try to choose kindness first and helps me be a better listener. Yoga has completely changed my lifestyle—it dictates it. I am now more conscious of what I put in to my body in all respects. Since yoga, I hold myself to a higher standard. Patience. Compassion. Love. Stress management. When I travel I like to go to a class in any city I'm in, no matter what the language or style. It is so cool to note the similarities and differences in yoga all over the world. I learn new transitions or cues or ways of introducing the deeper philosophies of yoga. This helps me keep it fun and interesting. Sometimes nothing. Sometimes acoustic, sometimes pop or reggae. I'm thankful for Songza! "You are loving, loveable and loved. Don't ever forget that." Want more How I Yoga? 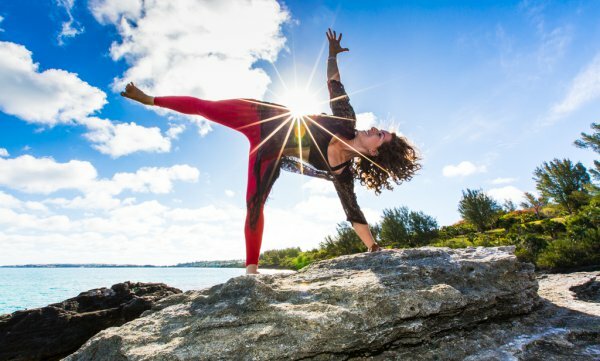 Check out our featured yogis right here!